93 min. Walt Disney Pictures. Director: Rich Moore. Cast: John C. Reilly, Jack McBrayer, Jane Lynch, Sarah Silverman, Alan Tudyk. It's not easy being nine feet tall and 643 pounds. And that's not even the hardest part about being Wreck-It Ralph, the leading character of Walt Disney Animation's fifty-second feature. The hardest part is being an arcade-game "bad guy," a professional wrecker tasked with endlessly destroying "Niceland" while heroic Fix-It Felix, Jr. saves the day. After decades of knowing his role and dutifully playing it, Ralph (John C. Reilly) has begun to want more out of life, such as it is for an 8-bit video-game character. He attends a "Bad-Anon" meeting with the likes of Clyde the Ghost from Pac-Man and Bowser from Super Mario Bros. but no one tells him what he wants to hear: that he could be a hero, that he could dare to be liked. And so Ralph goes off the reservation, doing the unthinkable by leaving his game. When this very model of a 1980s clumsy oaf gets wind of a hero-certifying gold medal in neighboring arcade game "Hero's Duty" (a modern first-person shooter), Ralph sets off on his own hero's journey. In his absence, Ralph threatens the world of "Fix-It Felix" with the undiscovered country from whose bourn no traveler returns: "Out of Order." Circumstances eventually deposit Ralph into a third arcade game for the lion's share of the picture. This is "Sugar Rush," an anime-inflected candy-land kart racing game, and it's home to the annoyingly adorable (or is that adorably annoying?) Vanellope von Schweetz (Sarah Silverman). Branded a "glitch" in her game, Vanellope is on her own quest for validation and thus forms an uneasy alliance with Ralph to get her across the game's finish line and allow Ralph passage home. The misfit odd couple —he with ham hands and halitosis, she with her jumpiness and histrionic personality disorder—are comedy gold, given the counterpoint of Reilly's gravelly warmth and Silverman's patented little-girl shtick, here skewing away from social satire and toward the literal. The fantasy's grounding in real-world concerns (who hasn't felt jealous of others' success? Who hasn't asked, "Is this all there is?") speaks to all ages, though the story's creative path to self-actualization with its zeitgeisty anti-bullying theme and conclusion "There's no one I'd rather be than me" speaks most eloquently to kids. 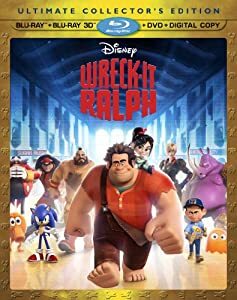 Mostly, though, Wreck-It Ralph is built for fun, by director Rich Moore (a Simpsons veteran) and screenwriters Jennifer Lee and Phil Johnston (Reilly also gets a special story-contributor credit), in its dazzlingly elaborate production design and kinetic 3D action. Wreck-It Ralph offers perfect casting (including Jack McBrayer as Fix-It Felix, Jane Lynch as a well-armed warrior, and Alan Tudyk—riffing on Ed Wynn—as King Candy), Who Framed Roger Rabbit-esque video-game-character cameos, and a cramming of clever comic touches, like the arcade's "Game Central Station," housed within a surge protector (cf. Monsters, Inc.'s "Scarefloor"). Save up your quarters, kids: it's worth it! Disney premieres Wreck-It Ralph on home video in an Ultimate Collector's Edition Blu-ray + Blu-ray 3D + DVD + Digital Copy combo pack. When it comes to the A/V specs, this one is—wow. Just...wow. Blazingly brilliant color and tack-sharp detail distinguish the flawless image, which dazzles in 2D and breathtakingly leaps into your living room in its 3D transfer (which, happily, sacrifices none of the image's brightness or color). Intricate and textured in all respects, this is one beaut of a picture, and the 3D version offers plenty of "pop" and depth—perhaps especially in the racing sequences and any scenes involving hovering video-game graphical elements that enhance the sense of visual layering—that add to the film's liveliness without distracting from story or character. A likewise gobsmacking DTS-HD Master Audio 7.1 surround mix proves just as state-of-the-art as the hi-def image transfer: the discrete separation of effects amazes in its clarity and precision, with dialogue always effectively prioritized and music as rich (or, as the case may be, 8-bit-evocative) as the filmmakers intended. Especially given that Ultimate Collector's Edition moniker, I'm a bit surprised that the bonus features included here aren't a tad more extensive, perhaps representative of a Disney strategy to reissue the title in a yet special-er edition at a later date. No commentary by Moore and/or John C. Reilly? Really? Anyway, what's here is good, including the Oscar-winning theatrical short "Paperman" (6:34, HD), presented in 3D on Disc One and in 2D on Disc Two. "Bit by Bit: Creating the Worlds of Wreck-It Ralph" (16:40, HD) makes for a fine making-of, including comments from director Rich Moore, producer Clark Spencer, writer Phil Johnston, art director Mike Gabriel, co-art director Ian Gooding, effects supervisor Cesar Velazquez, animation supervisor Renato Dos Anjos, et al, about the film's inception, design, and execution. Four "Alternate & Deleted Scenes" (14:28, HD)—"Ralph in Hero's Duty Prison," "The Maize Maze," "Vanellope's Volcano" and "Extreme EZ Livin' 2"— come with an introduction and optional commentary by Moore. Four "Video Game Commercials" (2:39, HD) include "Fix-It Felix Jr.," "Sugar Rush," "Hero's Duty" and "Fix It Felix Hammer." Last but not least, the Disney Intermission on this disc is a valid extra of its own, dubbed "The Gamer's Guide to Wreck-It Ralph" (9:23, HD) and hosted by Chris Hardwick of The Nerdist and Talking Dead. When you pause the film, this features comes up screen-saver-style, allowing Hardwick to wax enthusiastic about the film's in-joke Easter eggs. All site content © 2000-2019 Peter Canavese. Page generated at 04/19/2019 08:18:10AM.